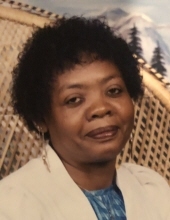 Irene Richardson James, 79, of Danville, Va., passed away on Tuesday, November 20, 2018, at her Centra Lynchburg General Hospital. She was born April 9, 1939, in Danville to the late Mary Lee Richardson Keene and the late Jack Hairston. Mrs. James was also preceded in death by her husband, Oscar James. She worked as a housekeeper at Riverside Health Care Center. Mrs. James was a member of Emmanuel Apostolic Church. She is survived by her daughters, Ida Michelle Poteat (Earl) of Danville, Wendy Thomas of Danville, Rose Chatten (John) of Danville, Almeda Medley of Ringgold, Va., and Tosha Medley of Danville; her son, Steve Thomas (Suzette) or Orange, New Jersey; as well as 22 grandchildren and 6 great-grandchildren. In addition to her husband and parents, Mrs. James was predeceased by her son, Sam Thomas. Funeral services will be held at 12:00 p.m. Monday, November 26, 2018, at Norris Mt. Hermon Chapel with Pastor Eddie Davis officiating. Interment will follow at Highland Burial Park. Norris Funeral Services, Inc. & Crematory, Mt. Hermon Chapel, 3995 Franklin Tpke., Danville, Va. is respectfully serving the James family. Online condolences may be made at www.norrisfuneral.com. To send flowers or a remembrance gift to the family of Irene Richardson James, please visit our Tribute Store. "Email Address" would like to share the life celebration of Irene Richardson James. Click on the "link" to go to share a favorite memory or leave a condolence message for the family.